GIF is an acronym for Graphics Interchange Format (did you know that?!) as a new way to present a moving image. It’s an image file, like a JPG or PNG, it doesn’t contain sound, but it can contain animation (and lots of it!). Usually created from parts of videos or multiple static images, animated GIFs have viral appeal, and thanks to online social platforms such as Facebook/Instagram, have reached heightened popularity. Back in 2012 word “GIF” was named the Oxford Dictionary Word of the Year. They have become a part of internet culture as a commonplace in our digital lives, from news to sports highlights to daily philosophical and comic relief. Compared with photos, GIFs are more appealing and more effective in Social Media strategy and compared with videos, it takes less time to create them and they are cheaper and easier to make. Besides, they hold a lot more info and much easier to portray a message than a static normal image. The entertainment value of GIFs is pretty obvious, but for the past years, brands have recognized its business value as well. Don’t be surprised if you start seeing more and more brands using GIFs as an essential part of their Social Media strategy because according to Reuters, more than 84 percent of communication in 2018 will be visual (and moving!). It’s perfectly natural to see that GIFs are going to be a crucial digital marketing trend for 2017. The fact that people only remember 20 percent of the text they read without visuals is sending everyone a straightforward message – a visual power is more important than ever. According to HubSpot, visual content is more than 40X more likely to get shared on Social Media than other types of content, so it’s obvious why many famous brands use GIFs to interact with their followers. How to use GIFs at your experiential event? 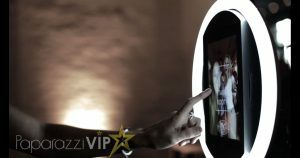 The VIP GIF Booth is the future of photo booths and perfect for any brand activation campaign or major event such as festivals, brand awareness campaigns, exclusive parties, etc etc . It is small, portable and easy for customers and guests of all ages to use. It is literally as simple as Touch to Start, Get Giffin, Send as either email or text and voila…Share that GIF online with friends!